As every business must need a well-written business plan, the need for business plan writing business in Bangladesh is much. Also, a business needs a business plan to carve a comfortable niche for itself in the very strict and competitive world of business. This is not only a document that provides a roadmap for a new business but a business plan is to change its concept and direction also. For it to be workable should contain the well-researched marketing, financial and operational viewpoint of a business with this all-important document. For example, if you go to a bank for a business loan, it’ll never accept your application until you have a good business plan. A lot of startup businesses always prefer to hire a professional business plan writer to write their business plans. This is common in Bangladesh that people are applying for business loans and getting rejected. Sometimes the authority describes the reasons and most of the times are not. The most common reason for the rejection is lack of the well-written business plan. As the government has opened the wide door of business ventures in Bangladesh, it’s one of the crying needs of the expert business plan writers for various businesses. So, you can start a business plan writing business in Bangladesh that might be the ideal business for you if you’re a very proficient writer and you have been constant in the business world. 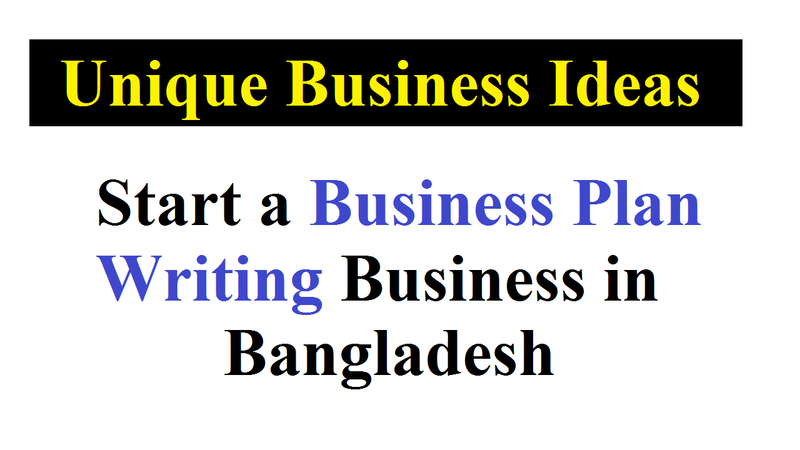 Now, let’s see how to start a business plan writing business in Bangladesh. The requirement of the demographic and psychographic composition is for services of a business plan writing business in Bangladesh. It includes business startups that are looking to establish themselves in their chosen line of business. Also, for those who have perhaps get loans to finance their businesses. Even for those who have already established businesses that need to make changes in their businesses so as to take advantage of new business opportunities. Because you don’t really need to meet face to face with your clients when drafting their business plans, a business plan writing service business can be started from any location. As it’s the trend of the digital age, you can call them on phone to make the necessary inquiries or you can hold video conferences with them. On the other hand, most business plan writing services operate online. That’s why you may not require an external location if you want to join the flow and also operate your business solely online. As the way to reach your clients, you only need a comfortable workspace in your home and the online presence. You don’t need any complicated equipment as business plan writing business is a service based business. What you need for it only a laptop/ desktop with an internet connection along with a phone, a good business plan writing app or software, office furniture like tables, chairs and shelves for stacking papers and documents etc. Also, they can all be gotten as fairly used because all these equipment is basic office requirements. But, you may require the services of a chief executive officer to ensure that you run a tight ship in your business plan writing service. Carve a market niche for itself and ultimately make a profit for any business to grow. This is because it needs to market its services to its target audience. It’s said in a proverb that, nobody would know where you are unless you say, “here I am”. That’s the point that marketing of your business does. It not only tells people where you’re but tells about the products you sell or the services you provide as well. But, it’s not like a one-sized glove that fits all business while doing marketing. As there are peculiar strategies for each business that would suit it, the same thing about the business plan writing business. No matter the scale you plan to start the business on every business needs finance. You can get your finance from your personal savings or you can source small loans from your family members and close friends when starting your business plan writing service business on a small scale. However, may contact your bank for a loan, you can sell your shares, you can get in touch with angel investors, or you can make use of your retirement benefits if you want to start on a large scale by leasing or renting an office and hiring business plan writers.